Interviewer: The sense of intimacy is heightened in these pictures. The separation between you and what you’re photographing seems to have disappeared. Nicholas Nixon: That’s nice. It gives me pleasure to hear that. In the book which accompanied the 1991 MoMA exhibition The Pleasures and Terrors of Domestic Comfort, curator Peter Galassi wrote about Gowin, speaking about how he had discovered “snapshot intimacy” as a potent artistic theme. “What he discovered,” Galassi states, “is that the essential power of the snapshot lies not so much in the candor of style or modesty of subject, as in the relationship between photographer and photographed.” When considering photographs of loved ones, both Gowin and his work tell us that the intimacy that artistically defines this work can be explained, or at least looked at, in terms of both an exclusive availability and an exclusive relationship between photographer and subject. 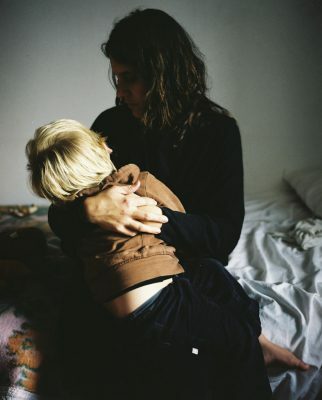 It is because of these very personal privileges that I was, for example, able to photograph my two year old son in his mother’s arms, in a room in Lisbon, having a hard time waking up from his afternoon nap. No one else could have been in that room to make that specific photograph without intruding on the scene and disturbing its intimate atmosphere. In an essay commenting on a photograph by Lee Friedlander, which shows what looks like a family just outside of their home, artist and writer David Campany suggests that one aspect of domestic photography is a photographer who simultaneously belongs to and is separate from the scene. The belonging refers to the fact that Friedlander is invited into his subject’s private space, most likely because he is a friend of the family. At the same time Friedlander is making the photograph, which means that he is not only physically placing the camera between himself and his subjects, he is also looking at the scene in front of him through a viewfinder, and in his mind he is busy framing the image. This act, the act of photographing, is what sets him apart from what’ s happening in front of him. A domestic scene may be a private scene, it is not, however, necessarily an intimate scene. In an intimate scene the stakes are higher, because an intimate relationship is at the heart of it, making it deeply personal and emotional. To simply belong to the scene is no longer sufficient. In order for a photograph to become intimate, one needs to participate in the scene, at the very least on an emotional level. 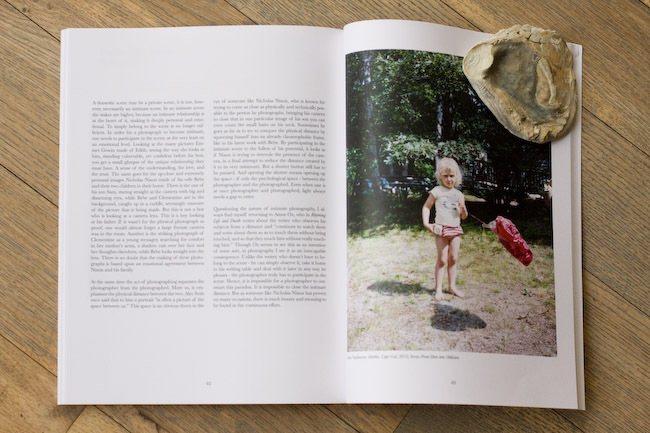 Looking at the many pictures Emmet Gowin made of Edith, seeing the way she looks at him, standing vulnerable, yet confident before his lens, you get a small glimpse of the unique relationship they must have. A sense of the understanding, the love, and the trust. The same goes for the up-close and extremely personal images Nicholas Nixon made of his wife Bebe and their two children in their home. There is the one of his son Sam, staring straight at the camera with big and disarming eyes, while Bebe and Clementine are in the background, caught up in a cuddle, seemingly unaware of the picture that is being made. But this is not a boy who is looking at a camera lens. This is a boy looking at his father. If it wasn’t for the physical photograph as proof, one would almost forget a large format camera was in the room. Another is the striking photograph of Clementine as a young teenager, searching for comfort in her mother’s arms, a shadow cast over her face and her thoughts elsewhere, while Bebe looks straight into the lens. There is no doubt that the making of these photographs is based upon an emotional agreement between Nixon and his family. At the same time the act of photographing separates the photographer from the photographed. More so, it emphasizes the physical distance between the two. Alec Soth once said that to him a portrait “is often a picture of the space between us.” This space is an obvious thorn in the eye of someone like Nicholas Nixon, who is known for trying to come as close as physically and technically possible to the person he photographs, bringing his camera so close that in one particular image of his son you can even count the small hairs on his neck. Sometimes he goes as far as to try to conquer the physical distance by squeezing himself into an already claustrophobic frame, like in his latest work with Bebe. By participating in the intimate scene to the fullest of his potential, it looks as if Nixon is trying to overrule the presence of the camera, in a final attempt to reduce the distance created by it to its very minimum. But a shutter button still has to be pressed. And opening the shutter means opening up the space – if only the psychological space – between the photographer and the photographed. Even when one is at once photographer and photographed, light always needs a gap to enter. Questioning the nature of intimate photography, I always find myself returning to Amos Oz, who in Rhyming Life and Death writes about the writer who observes his subjects from a distance and “continues to watch them and write about them so as to touch them without being touched, and so that they touch him without really touching him.” Though Oz seems to see this as an intention of some sort, in photography I see it as an inescapable consequence. Unlike the writer, who doesn’t have to belong to the scene – he can simply observe it, take it home to his writing table and deal with it later in any way he pleases – the photographer truly has to participate in the scene. Hence, it is impossible for a photographer to outsmart this paradox. It is impossible to close the intimate distance. But as someone like Nicholas Nixon has proven on many occasions, there is much beauty and meaning to be found in the continuous effort. 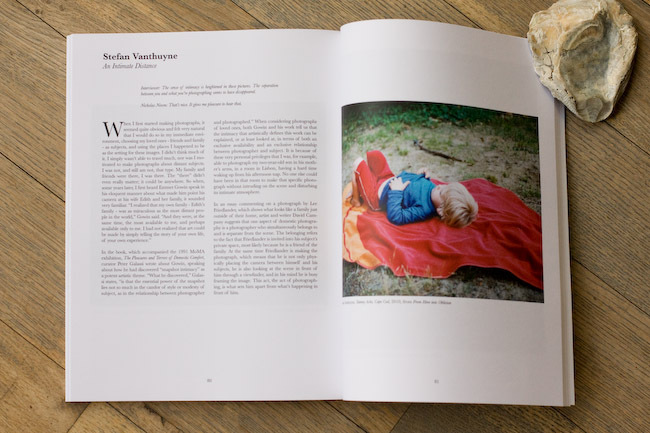 The short essay An Intimate Distance, accompanied by images from the series From here into oblivion, is published in The Ones We Love Magazine: Issue One (Spring, 2015).